Vivekananda Kendra Nagdandi Kashmir organised a week long Science workshop for the students of class VI to XII of various schools of Anantnag Dist along with the collaboration of Gyan Setu, Pune. 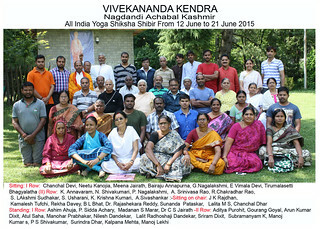 All India Yoga Shiksha Shivir (Medium- Hindi) was held at Sri Ramkrishna Mahasamelan Ashram Nagadandi under the Aegis of Vivekananda Kendra from 12 to 21 June 2015. The first “Kashmiri Pandit Youth Sammelan” was organized by Vivekananda Kendra, Kanyakumari - Shree Rama Krishan Mahasammelan Ashram (SRMA), Nagdandi Anantnag, Kashmir. A 15 days (20 August to 3 September 2012) Yoga Shiksha Shibir (YSS) was organized at Nagadandi (Kashmir), an oldest branch centre of Vivekananda Kendra Kanyakumari.